Contemporary Christmas Wreath – This Snowman Woolen Wreath by TAG is a vibrant addition to any modern Christmas decor scheme. The red and white polka dot detailing is both timeless and bang on trend. The snowman complete with bird perched on his head is just too cute. This is the perfect Christmas wreath for anybody who wants to update the look of their decor while still partaking in the spirit of the season. This contemporary Christmas wreath is made from wood and synthetic wool yarns with the wood wrapped in foam and cotton layers. It is part of the Hope, Peace and Joy collection and during these tough times we could all do with a little extra of these in our lives! Given the materials used to make this Christmas wreath, I would advise you use in indoors only unless you have a very sheltered and dry porch. 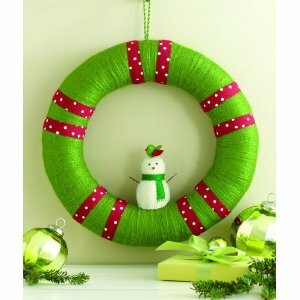 At time of writing there is a very nice discount available on thiscontemporary Christmas wreath right here! Next articleRed Berry Wreath – Bring Christmas to Your Door!